Seasonal Eats: Forage Your Local Loquats! 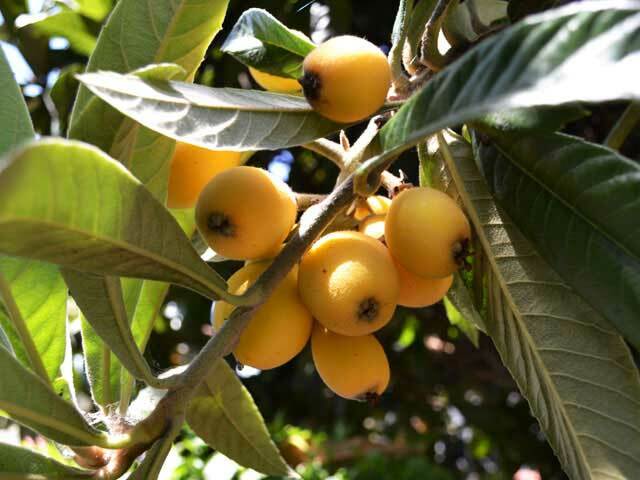 Though they&apos;re rarely sold commercially, if you&apos;ve been in southern California for more than just a vacation, you&apos;ve probably encountered loquat trees all over the landscape, sometimes in parking strips, empty lots, and often used in decorative landscaping on private property. If you grew up here, and your parents knew they were delicious and safe to eat, you&apos;ve been eating them for years, surprising friends, co-workers and other transplants by sharing this sweet and abundant treat. I grew up in a house with a loquat tree and loved twisting the fruit off the tree every spring (March through July), dusting off the fuzz, eating the fruit and then throwing the seeds aside for another. When I moved to my current place, I was happy to see two loquat trees bordering my patio, and rehabilitated them from decorative foliage into fruit-producing treasures. Loquats are indigenous to southeastern China, from whence they get their name. They&apos;re easy to recognize by the dark green, leathery leaves, covered by a yellow fuzz that also covers the fruit, which grows in clusters. The fruit itself is honey-sweet and tangy, but they&apos;re hard to compare to popular fruits by flavor. The texture is a bit like an apricot, but the seeds (often called loquat nuts) are not like those of stone fruit. Loquats are distant relatives of apples, and have a high sugar, acid and pectin content in common, but the texture isn&apos;t the same. In Chinese medicine, loquat syrup and tea (made from the leaves) is a popular remedy for sore throats. It&apos;s also said that eating them in quantity may produce sedative effects. The seeds are slightly poisonous, containing small amounts of cyanide, but there are a few uses for them that seem to be harmless, which we&apos;ll detail below. Loquats have a glycemic load of 4, and are a good source of dietary fiber, Vitamin B6, Potassium and Manganese, and a very good source of Vitamin A. They are delicious fresh off the tree, and are sweet even when still a bit firm. If you eat them fresh, just dust them off and enjoy, but be careful where you throw the seeds, since most all of them will sprout—or take them home and pot them up to grow your own. To prepare loquats for use, slice around them lengthwise and twist apart, then pop out the seeds and peel out the seed membrane. Loquats are also great when mixed in fruit salads, used as the fruit in fruit salsas or fruit-based hot sauces, and are a great addition or base for jams and jellies due to their pectin content. Loquatworld.com has an extensive collection of spiced and preserved loquats, and maybe the lowest-sugar recipe for pie / cobbler i&apos;ve found so far. Due to their high yield, loquats are a choice addition to smoothies on their own, or with any of your favorite fruits. This loquat tea smoothie looks especially delicious. As the season moves into summer, blend them up and pour into popsicle molds, or cool off with this loquat lemon-mint sorbet. If you&apos;re looking for springtime desserts for loquats, try out loquat strawberry pie while strawberries are fresh, and then spiced loquat pie later in the season. If you can deal with the butter and sugar here, this loquat upside-down cake looks amazing. There&apos;s also this lovely loquat crumble that can be made throughout loquat season. For more savory uses, you can add loquats to your homemade barbecue sauce recipes, or chop them up and freeze them for use in loquat apple chutney when apples ripen in late summer. When stocking your bar this season, loquats make a delicious fruit infusion, mixed with others or on their own, in vodka, rum or brandy. Simply soak the cut fruit in a jar with your preferred liquor, taste frequently, and strain it off when you like the flavor. If you&apos;re more adventurous and want to experiment with fermentation, there are many references to making loquat wine, which I&apos;ve decided I have to try this year. Once you get all those loquat seeds together, you might consider roasting them and making this homemade Italian loquat seed liquor which is another one high on my list this year. For my own recipe this week, I found some chutney ideas and decided to increase the ginger and eliminate the sugar for my own version. 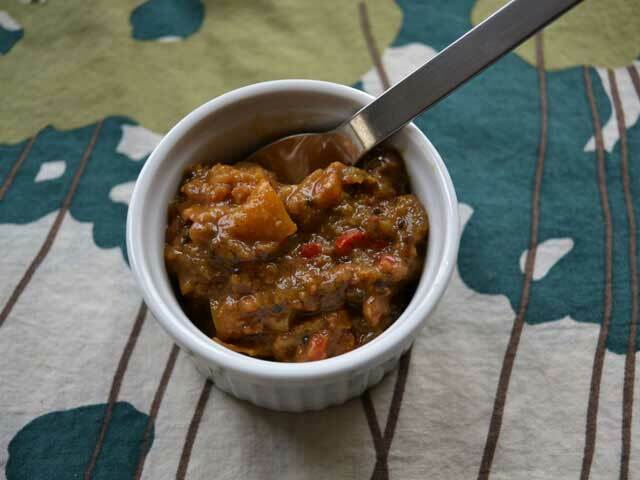 Enjoy this sweet & spicy condiment on meats and roasted vegetables, or over samosas.